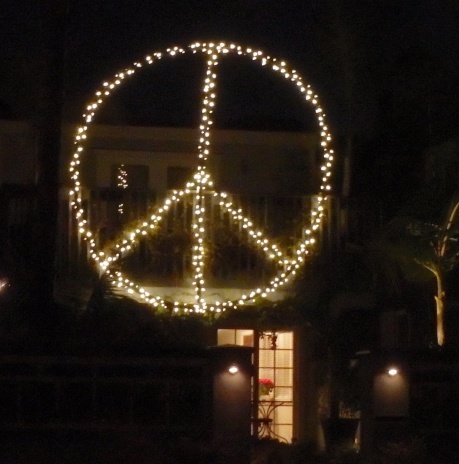 Large home-made peace sign in lights on Santa Monica Ave. Hats are now on sale in OB to help Kyle Witkowski’s family. They are being sold at OB Surf Shop, Hodads, & Ace Tattoo. The come in assorted colors for $15.00. Kyle was the young OBcean who died in a car accident around New Year’s. 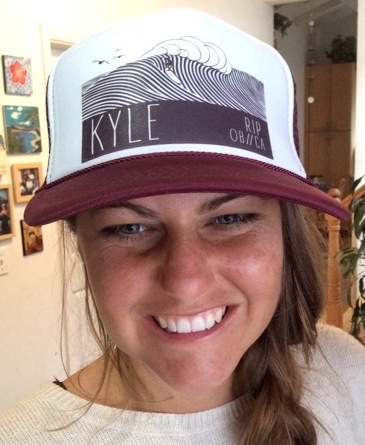 The OB Rag will do a notice if there is any public memorial or paddle out in Kyle’s honor. World Oil’s Sunset Plaza at Sunset Cliffs and Voltaire is looking like its had some work on the site. Residents have noticed a spike in activity behind the curtains. 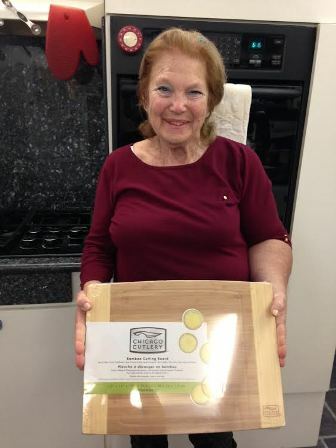 Judi Curry finally got her Chicago Cutlery breadboard! If you’re not up on this latest controversy, please check out Judi’s post on how Stumps market got her goat. Currently the post has 77 comments as it sparked several discussions that had nothing to do with Stumps, stamps or cutting boards. Because of two recent deaths concerning Sunset Cliffs, there has been a renewed interest in the beautiful but dangerous local treasures. Also, we found somebody local who has been tracking deaths and serious injuries due to or from around the Cliffs for the last 6 or so years. They say since then, there’s been an average of 4 deaths per year. We’ll definitely do some digging into this and get a fuller report. There is definitely something going on in what is supposed to be the new Apple Tree coming in on Newport Avenue these days. Inside, there are shelves and other market materials. The owner of the former Apple Tree – which is about to open with the new CVS – had promised for many moons that he was going to open a food market on OB’s main street. Looks like his promise is coming true. No news on actual opening date. Gretchen Newson – prez of the OB Town Council – was on KUSI very recently in a segment about homeless people in Ocean Beach. After citing all the problems people feel are due to homeless youth (public urination, public drunkenness, agressive panhandling, bike thefts, break-ins), Gretchen said that the only way OB can get help for these people is to complain to the City and County that OB needs more resources. To do that, she advises people to call the police when they witness homeless individuals commit transgressions. What Do You Think About Trying to Get OB Named as National Surfing Preserve? 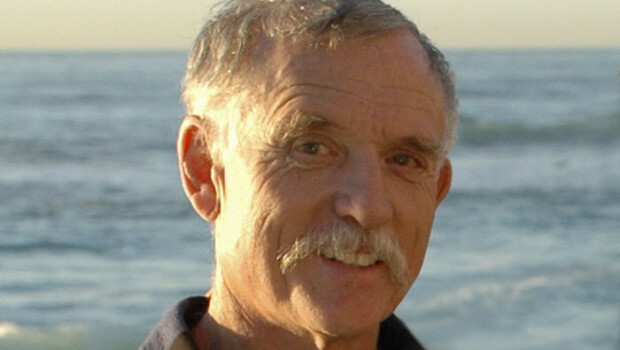 There will be a paddle out in Barry Ault‘s honor at Luscomb Point at 2pm on January 17. A celebration of his life will be held at San Diego Yacht Club on Sunday, January 18. The family will be placing his ashes in the sea he loved. In lieu of flowers, donations may be made to the Surfrider Foundation in his memory. Ault, the legendary surfer, was 71. He died from contacting a deadly and aggressive form of staph just days after he fell ill on Dec.23rd after surfing southern Sunset Cliffs. A brand new set of bike racks have appeared on the sidewalk near the OB Rec Center on Santa Monica Avenue just recently. Ocean Beach Historical Society presents their latest program, Thursday, Jan. 15, 2015 at 7 PM at the PL Methodist Church :“Tales from the Trails: San Diego’s Rich Outdoors History” by Author Thomas Leech. Leech’s program will focus on stories linked to our natural environment and the early colorful characters who played key roles in shaping San Diego. How Father Junipero Serra, Kit Carson, Hatfield the Rainmaker, Ysidora Bandini, and the Cisco Kid fit in? Leech will include many intriguing aspects of local history. For several years Leech was Editor for the Outdoors Forum for San Diego Magazine online. This led him to write a book on hiking, biking and camping in San Diego. The PL Methodist church is at at 1984 Sunset Cliffs Blvd., O.B. Tiny passed away last night according to his family post on the taverns facebook page. Thanks TR, we met the corrections above. Tiny’s is a bar&grill on Voltaire just east of People’s. Not sure about Newport Ave. Tiny’s??!!? When/where was that? The editing of the KUSI story misconstrued my message a bit. I stated that homelessness is NOT a crime (which the reporter stated in the beginning of the clip), and then listed off a list of crimes that residents should report to the police if they witness criminal activity. We spoke at length about the new youth/traveler homeless community and how this population is different than the chronically homless or homeless veterans. I ended by calling upon the City and County to deliver resources for coordinated homelessness outreach, housing, and services to the beach communities, and reminding residents to report criminal activity. What also got cut out of this interview is me conversing with the homeless person next to the ‘homeless by choice’ youth – this other homeless person is chronically homeless with severe health issues. When I asked each of them – ‘what would it take to get you off the streets; if a County worker came out and offered you shelter or housing, would you accept it?” The chronically homeless person said ‘yes, absolutely – I don’t know how to get the help I need, and I don’t want to live on the streets.’ What makes me sad is that some people will watch this interview and attach a blanket belief that ‘all’ homeless are ‘homeless by choice’ or that ‘all homeless are criminals’- which is so not the case. It is my hope that the County and City will dedicate additional resources and proven strategies to help our chronically and veteran homeless, and to conduct intensive coordinated outreach to the homeless youth and find solutions to get them off our streets and back into a stable environment. We also need to report any and all criminal activity. Respect OB! Thanks so much Gretchen for clarifying your stance. Once again the agenda of the TV station quashes the actual unreported message of those involved. If there is not some “stick” with the carrot, the numbers will increase and increase. Why don’t the other beach communities have this problem? Have you been down to dog beach in the morning lately? Go spend a few early morning there in the dunes. I don’t like to bring my dogs there anymore after one of them was sniffing a fuggin needle! A few days ago atleast four different groups of homeless were camped out in the dunes, leaving human waste, needles, trash and glass. There are many services available downtown and every cop that deals with homeless gives them the info about getting help…but many choose not to use them. Without a stick, all you are doing is giving them carrots…and that doesn’t work to even train a dog. FWIW- Cops were there at 5:30 this morning patrolling on sand with their vehicle. There’s a story here editordude. The story is how KUSI screwed up Gretchen’s message, totally twisting it the way they wanted it to come off, desplite what really happened. Well, certainly this is no surprize that mainstream media woujld do something like this. Keep gettin g your message out there Gretchen. Amazing approach to homelessness…give them a home! I believe both Salt Lake City and Portland have taken this approach and found it quite successful. 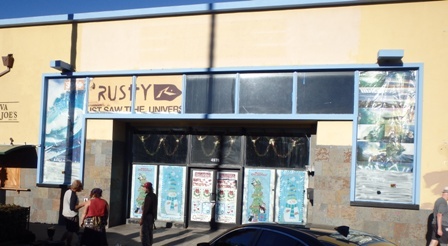 I believe Tiny’s is still in business and it is on Voltaire… 4745 Voltaire Street. Did it used to be on Newport? I know Editor Dude and The OBR Staff have a place in their heart for the homeless, and I respect and admire that compassion. But many Obecians are not fond of them and wonder why there is such a concentration of them in OB. The relaxed atmosphere and tolerance of OB pulls in homeless and pushes away enforcement efforts. 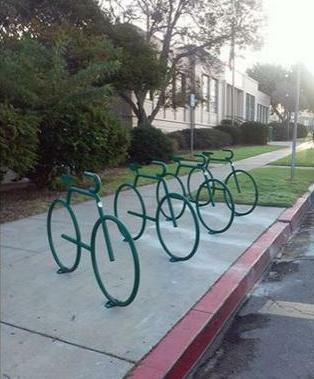 I am sure La Jolla, Del Mar, Encinitas, etc are quite fond of this arrangement. I recently moved from OB to College Area and there are many things I miss about OB, but the homeless population is not one of them. So couch fires in the street and frat rats throwing up in your front yard are more tolerable than the homeless ? I think it was too early in the morning when editordude wrote this up about Tiny and got it mixed up with another place on Newport Ave in the 1970s-80s. Anybody know what he was thinking? We apologize for the mix-up. Just a comment about the new bike racks on Santa Monica Ave. As I can only be thankful that there are more bike racks being installed in Ocean Beach, the location may be questionable to many. These racks were requested on behalf of the students at OB Elementary and families with children on the kindergarten side of the school, however, this was not the original intent for the placement of the new racks. The original discussion with the City was to install the bike racks adjacent to the crosswalk, creating the same effect as a curb extension that would provide traffic calming and safety for the students and residents using the crosswalk. Unfortunately, this was not feasible and I was I was not contacted when placement was determined, therefore was not able to weigh in on the decision process. After noticing where the city had determined the placement for the new racks, I reached out to city staff to see if these could be changed as I believe it would have been more beneficial to have two located directly in front of the OB Rec Center. Although these are not in an ideal location, I hope they are welcomed and will get much use. There is also hopes that many will notice them and be encouraged to take an enjoyable ride to their local school and rec center more often. Thank you to all for riding and sharing the road. Drove by the racks today and saw a small childs bike and helmet locked to one. Made me smile! On behalf of some of us, thanks so much Nicole. Are you ready for an interview with the OB Rag? It was your call Gormlie! But please can some old-timer help us out here. What was the name of the ol’ pizza and beer joint where the sushi place is now on lower Newport, next to JungleJava? Nice peace sign. I’ve seen it at night. Perhaps they will see this photo and let us know how it came about that they constructed it. Yea I did it and it was very easy. Patty is great to work with, as she’s the tech person I believe. what happened i think is that a whole bunch of us early obrag commenters got our avatars early in the game and most of us are late nighters. i’ve noticed we don’t really come on here all that much lately. Who is the young woman wearing the hat for Kyle’s family? Thanks for the memories Jeffeck.